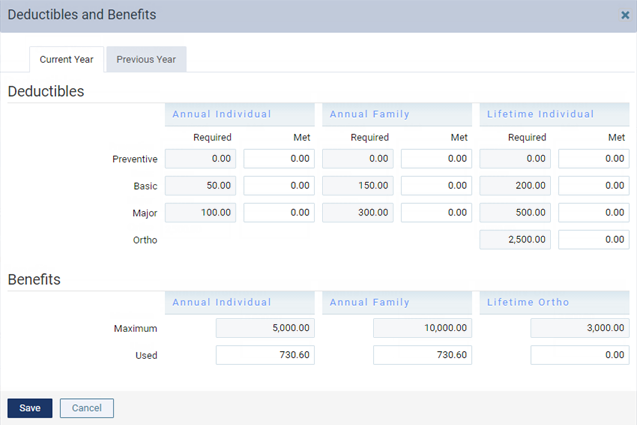 You can update the required and met deductibles and maximum and used benefits for the current and previous years of a patient's insurance plan. Along with coverage tables, deductibles and benefits allow for accurate insurance estimates. As needed, for the Current Year and/or Previous Year, type or change any Met amounts for Deductibles and/or Used amounts for Benefits. Note: Updating any Required deductible or Maximum benefit amount updates the deductibles and benefits for all patients who have this insurance plan attached to their records.